Gates admits the Obvious…..The US can’t stop Iran from getting a nuclear bomb…unless? The Dog has been arguing this point for the last year…. If so much that I stop talking about the subject because President Obama seems to be in fairyland…..
No diplomatic policy is going to stop the Iranian from their goal of having a nuclear bomb and trying to further destabilize the Middle East….. This certainly is no secret…. 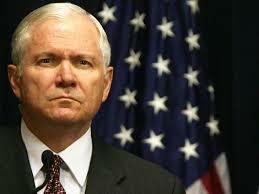 Even a lowly Dog can figure this out……..
Defense Secretary Robert M. Gates has warned in a secret three-page memorandum to top White House officials that the United States does not have an effective long-range policy for dealing withIran’s steady progress toward nuclear capability, according to government officials familiar with the document. Several officials said the highly classified analysis, written in January to President Obama’s national security adviser, Gen.James L. Jones, came in the midst of an intensifying effort inside the Pentagon, the White House and the intelligence agencies to develop new options for Mr. Obama. They include a set of military alternatives, still under development, to be considered should diplomacy and sanctions fail to force Iran to change course. Officials familiar with the memo’s contents would describe only portions dealing with strategy and policy, and not sections that apparently dealt with secret operations against Iran, or how to deal with Persian Gulf allies. One senior official, who like others spoke on the condition of anonymity because of the sensitive nature of the memo, described the document as “a wake-up call.” But White House officials dispute that view, insisting that for 15 months they had been conducting detailed planning for many possible outcomes regarding Iran’s nuclear program. But in his memo, Mr. Gates wrote of a variety of concerns, including the absence of an effective strategy should Iran choose the course that many government and outside analysts consider likely: Iran could assemble all the major parts it needs for a nuclear weapon — fuel, designs and detonators — but stop just short of assembling a fully operational weapon. Note….This story is quite frankly scary…….What have the people in our governement been thinking? Why is this a wake call?…..Anyone with a half a brain could see this coming……..
Gates admits the Obvious…..The US can't stop Iran from getting a nuclear bomb…unless? 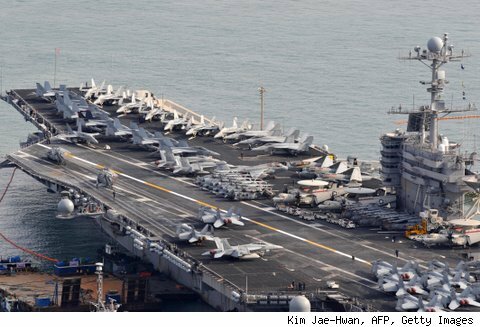 During the Cold War, the Pentagon built the greatest naval and air forces the world had ever seen, endowing the United States with the superpower ability to land huge military forces anywhere in the world, at any time, whether invited in or not. So it was that Washington, using its armada of aircraft carriers, cruise missile-launching submarines, fast cargo ships, long-range bombers, airlifters, and air refueling fighters, could eject the Iraqis from Kuwait (1991), bomb Serbia (1999), kick over the Taliban regime in Afghanistan (2001), and knock off Saddam and his cronies (2003). Everybody else had to meekly follow along (or sit on the sidelines). But now the party’s over. The United States, Pentagon strategists say, is quickly losing its ability to barge in without permission. Potential target countries and even some lukewarm allies are figuring out ingenious ways to blunt American power without trying to meet it head-on, using a combination of high-tech and low-tech jujitsu. At the same time, U.S. naval and air forces have been shrinking under the weight of ever more expensive hardware. It’s no longer the case that the United States can overwhelm clever defenses with sheer numbers. and this is the situation right now…..
As all that unfolds, the Pentagon’s attention will be elsewhere. Gates has directed that the Defense Department’s strategic and budgeting focus in 2011 be directed at fighting “the wars we are in today,” in Iraq and Afghanistan. Iranian opposition figure criticizes his government’s actions………. The Dog wonders why he is coming out with this now…after being silent for so long? But in his first public comments since protests failed to disrupt the Feb. 11 anniversary celebration of the 1979 revolution, Mousavi offered few specifics on what the so-called green movement should do next. For now, Mousavi said he and fellow opposition figure Mehdi Karroubi would press for permission to hold their own rally and reach out to more Iranians. Mousavi also offered conciliatory gestures to Iranians opposed to the protesters, acknowledging their hostility toward his movement’s aims and methods in the wake of the country’s disputed June 12 presidential election. But Mousavi was harshly critical of the authorities. Dissecting the mechanics of the Feb. 11 rally, widely regarded as a victory for the hard-liners, he said the government “spent exorbitant amounts by mobilizing buses and trains across the country” and forced government employees to attend the rally in an attempt to overwhelm the opposition. Iranian opposition figure criticizes his government's actions………. Iran pushes forward in trying to increase trade to Iraq……. While America and Europe seek to squeeze more sanctions on Iran…..That country seeks to improve trade with Iraq…..The Dog has said this more than once here sanctions will NOT work against the regime……which isn’t stupid…on the face of this it seems to be a deliberate move to out fox the United States strategy of trying to limit Iran’s influence in the region….. The act of improving commercial ties to Iraq by Iran will undoubtedly pull both countries closer no matter how many troops the United States leaves behind….In addition, as the United States has done around the world commercial ties means that Iran can continue to exert influence over wide parts of the Iraqi population which will forced to trade and interact with Iran as an economic partner…..
Make no mistake….. Iraq is desperate to attract investments no matter where it come from…..
Here’s the link for the piece from Reuters……. BASRA, Iraq (Reuters) – Iran hopes to double trade with Iraq to $8 billion this year, an Iranian diplomat said on Sunday, shrugging off Western-backed sanctions aimed at curbing business with the Islamic Republic. Shi’ite Muslim Iran is the main trading partner of Shi’ite-led Iraq and has been one of the largest investors in Iraq since the fall of Sunni dictatorSaddam Hussein. A series of agreements between Baghdad and Tehran could boost bilateral trade between the two countries to $8 billion in 2010, up from $4 billion last year, Iran’s consul in the southern oil hub of Basra Mohammed Reza Baghban said. “We are sure that, if there are no obstacles in Iraqi-Iranian economic relations, bilateral trade between the two countries will be double what it was in 2009,” he told reporters at an Iranian trade fair in Basra. The main areas of trade between the two countries are the construction, food and industrial sectors. The United States and its European allies have been trying to pressure Iran to suspend its disputed nuclear programme, which the West suspects is aimed at making bombs. Tehran says the programme is for peaceful purposes and will not be halted. The Islamic state is currently under U.S. and U.N. sanctions. Iraq wants to boost economic ties with its neighbors and attract investment to develop an infrastructure and economy battered by years of war, under-investment and sanctions. Obama was right when he urged her come on board his administration …she WAS needed……. Secretary of State Hillary Rodham Clinton said on Monday that the United States feared Iran was drifting toward a military dictatorship, with the Islamic Revolutionary Guards Corps seizing control of large swaths of Iran’s political, military, and economic establishment. The United States, she said, was tailoring a new set of tougher United Nations sanctions to target the Revolutionary Guards Corps, which controls Iran’s nuclear program and which she said had increasingly marginalized the country’s clerical and political leadership. Mrs. Clinton’s remarks were remarkably blunt, given her audience in Qatar, a Persian Gulf emirate with close ties to Iran. But they build on the administration’s recent strategy of branding the corps as an “entitled class” that is the principal menace in Iran. The United States, Mrs. Clinton said, would protect its allies in the gulf from Iranian aggression — a pledge that echoed the idea of a “security umbrella” that she advanced last summer in Asia. She noted that the United States already supplied defensive weapons to several of these countries, and was prepared to bolster its military assistance if necessary. Still, as the Obama administration moves from diplomacy to pressure, its policy is edging closer to the hard line toward Iran that Mrs. Clinton advocated as a presidential candidate. 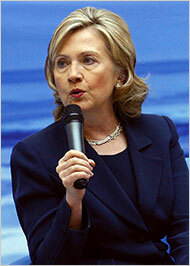 At times on this trip, her public comments have sounded a lot like her words on the campaign trail. The Dog feels that Iran’s government is pushing for a bomb and suppression of the increasingly evident opposition to it’s iron fisted policies and actions….While increasing it’s rhetoric…the West continue to work by all means to contain and undermine the current rules of Iran……this will move to a showdown sometime in the future…no doubt…. Iran moves ahead with Uranium processing……but has it’s problems…..
…..IRAN WANTS A NUCLEAR BOMB……..Period…..
No amount of talking and wishing is going to stop that fact…..To the United States and the West’s credit….The plan is now to to deal with that reality….. This from the piece…..on Iran’s intentions…..
Mr. Ahmadinejad’s order on Sunday may represent nuclear gamesmanship; it is unclear if the country has the capacity to enrich its fuel to roughly 20 percent, from about 5 percent, as Mr. Ahmadinejad was ordering. Doing so would require retooling the configuration of the nation’s centrifuges at a moment when Iran appears to have run into considerable technical difficulties at its nuclear plants. It is unclear if those troubles have been caused either by its own technical failings, or sabotage by Western intelligence agencies, or both. American intelligence officials have told Congress and close allies, in closed briefings, that covert efforts to interfere with Iran’s production capability are extremely active. This also from the piece….. The Iranian announcement Sunday appeared part of Tehran’s dual approach to confront western capitals seeking to isolate and penalize it for backing away from the exchange deal negotiated in Geneva in October. Iran has been saber rattling, testing missiles, holding war games, and on Saturday announced mass production of two missiles, one that can destroy “low-altitude aerial targets that fly at low speed and the other “equipped with two warheads and can destroy armored vehicles,” according to state owned Press TV. The plans to increase enrichment to 20 percent fit with that leg of the strategy. Mr. Ahmadinejad is betting that the threat itself may force the United States, Europe and Russia to provide fuel on his terms; American officials have said the move would only speed the effort to impose sanctions. It may also affect Israel’s calculation about how far it is willing to allow Iran to get to a weapons capability before launching an attack on Iran’s nuclear or missile facilities. Iran remains extremely tense, as it wrestles with a severe economic crisis, and the prospect of huge new protests on February 11, when the nation marks the anniversary of the revolution.